The summer holidays are giving Yaxley boss Brett Whaley a headache. The Cuckoos squad features a number of players who are employed in schools. And that means Whaley has been hit by availability issues in the early weeks of the new season. Yaxley started with a bang by thumping hapless Huntingdon 12-0 in an FA Cup extra preliminary round tie, but have since lost two of their opening three United Counties League Premier Division games. The latest loss arrived at Eynesbury on Tuesday night when Charley Sanders halved their arrears in a 2-1 reverse. Whaley said: “We have a good squad, but we’re looking like a bunch of individuals at the moment. That’s because we’re struggling with availability and a few injury niggles at the moment. “We’ve got quite a few people with school-based jobs and they obviously have to go away during the summer holidays. “We’ve had to play four different formations, and pick four different teams, for our four games so far and it has been disjointed as a result. Yaxley have two cup ties in the coming days. They entertain higher-level Dereham in an FA Cup clash this Saturday before hosting local rivals Peterborough Northern Star in a Hinchingbrooke Cup date on Tuesday. Jevani Brown hit an injury-time winner as Stamford collected their first win of the Evo-Stik Division One South season on Tuesday night. Brown inspired a Daniels turnaround in a 2-1 success at Rugby, hitting a 72nd minute leveller ahead of his last-gasp decider. Spalding also claimed their first success at the same level on Tuesday night. Cenk Acar and Bradley Wells hit second-half goals to earn a 2-0 victory against Carlton at the Sir Halley Stewart Playing Field. 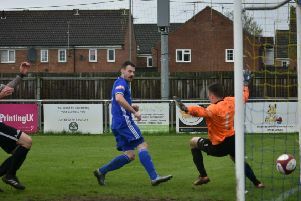 That’s three goals in two games for Wells who also bagged a brace last Saturday when the Tulips threw away a two-goal cushion in a 2-2 draw at Bedworth. Both teams enter the FA Cup at the preliminary round stage this Saturday with Stamford going to Sleaford and Spalding at Bury Town.